In the round 3 of Australian Masters 2017 I played against another Varangur army, also led by Ken! :) In fact, there was a "best Ken" competition going on during the Masters and as far as I know both Ken's had it a few times before. It was great to play against both of them again too! In fact, Ken "Chaarge" who was my opponent this time, played against me during one of the Valley of Kings events before (although back then he used Trident Realms army). I was very curious how would I do against his all mounted, super aggressive Varangur force that embraced an opposite concept to the one I was using myself. Four tough cavalry regiments that are not only great at charging but can comfortably receive an attack and hit back hard regardless. I knew Ken likes to play aggressively so I had to come up with the plan to be able to slow down and divide the units, even if it happened that entire army would advance towards me at a double in turn 1. In general, it would always be a good idea to force hindered charges as that gives better chance to slow these powerful units down. Due to smaller size this army may not be able to protect the flanks all the time so I would need to be ready to exploit any opening available. Finally, if I could focus my shooting properly I may have a chance to take one unit down. 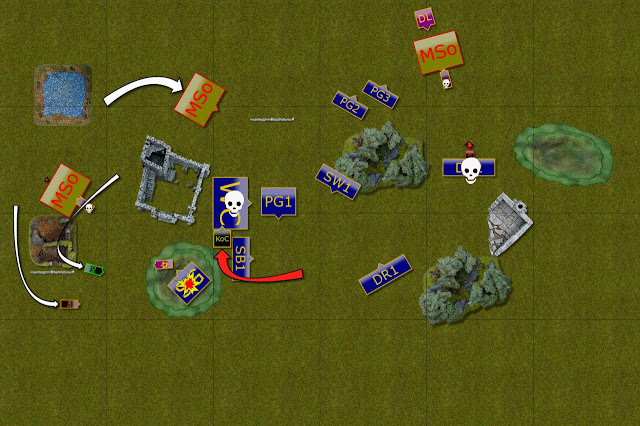 We played Invade scenario and that in itself was a very interesting situation. 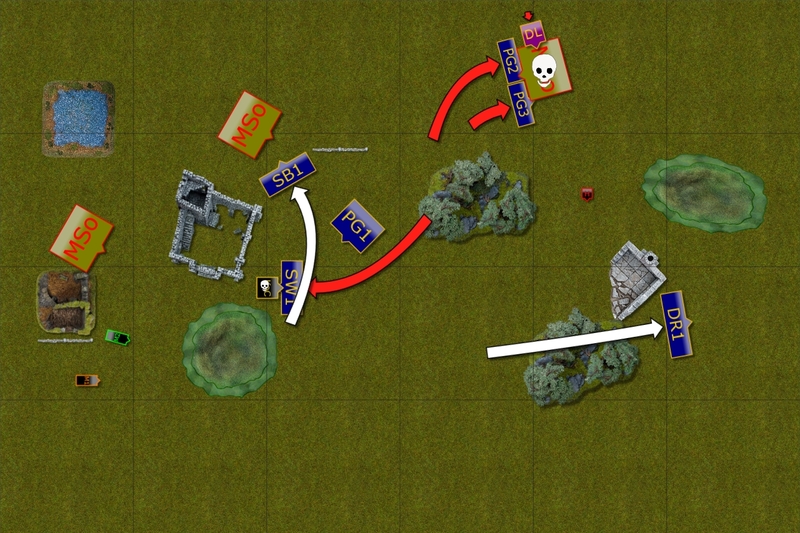 Ken's army would love to move to the other half of the board as he wants to charge as many times as possible and it is even better if in the process he can get his units to enemy deployment zone. At the same time with four regiments and one monster his total unit strength is 9 while I had five regiments, four troops and one monster with combined unit strength of 15. 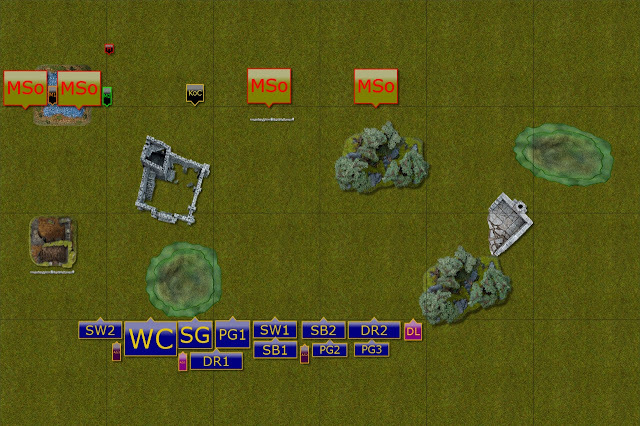 That means that I could potentially use the difference to slow the Varangur mounted units and get my own to the other side to win the scenario. 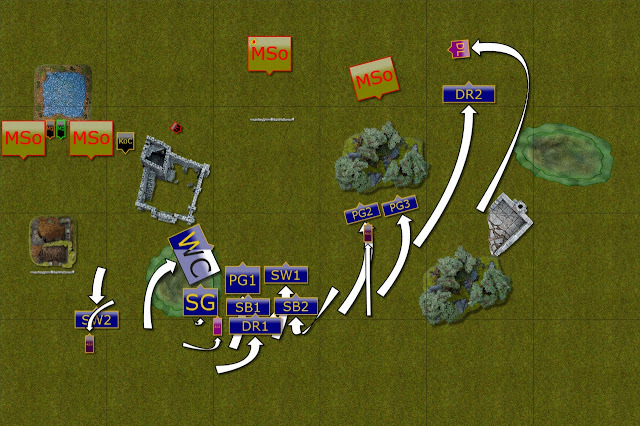 However, with two extremely mobile King and Herja my own units could have been slowed down as both models are very powerful and can hold entire battle lines all by themselves. 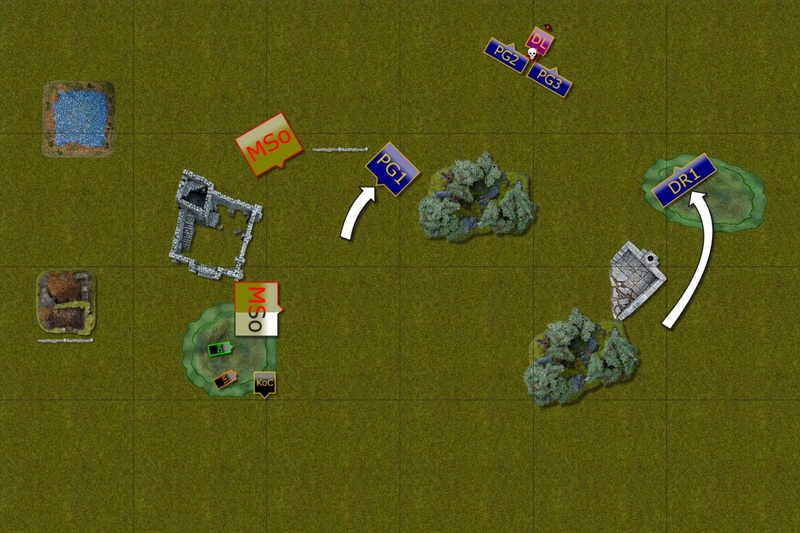 In the end I decided to try and shoot at a single unit in the center and did not deploy units on the right to avoid confrontation with the regiment with Pathfinder. 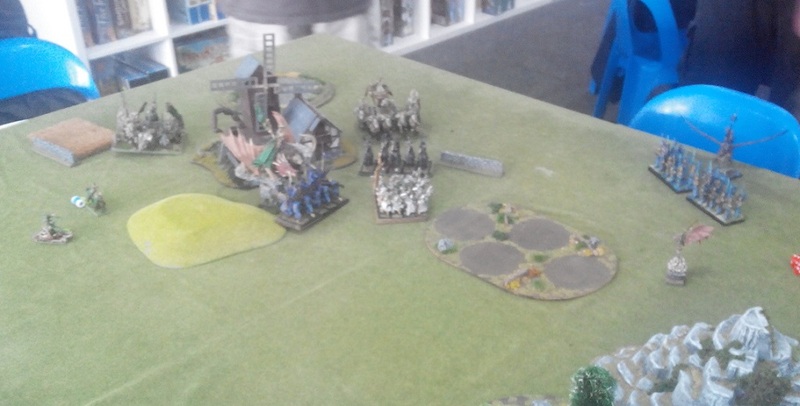 However, Ken placed this unit on my left flank so maybe that was not necessary. I also deployed in double line to be able to intercept fliers and occupy them for a turn or two. 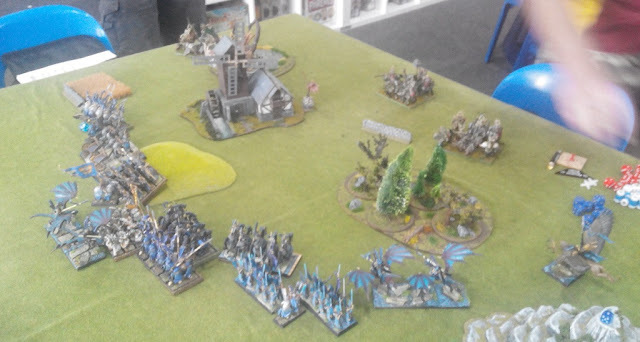 Seeing the majority of Varangur army deployed on my left I decided to go to the right with Drakon Riders and the Lord to use their speed to get into the flank of the unit of knights deployed there. 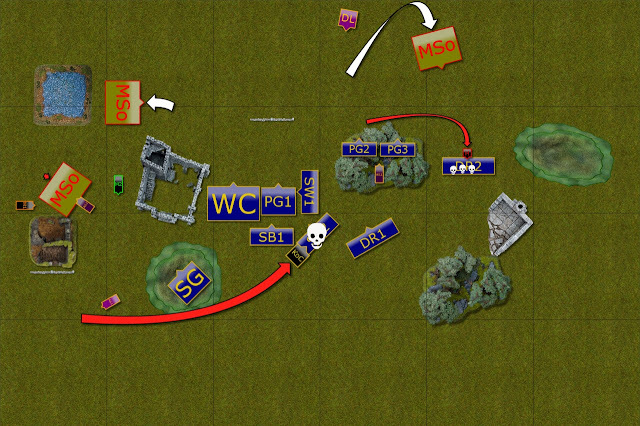 My refined plan was then to slow the units on the left, shoot down the unit in the middle and destroy the one on the right. 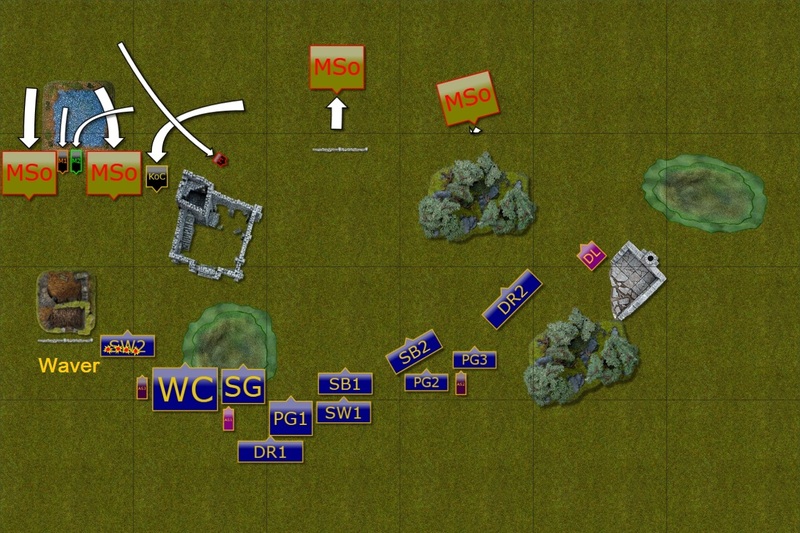 If I could achieve that I should have enough units moving to the enemy zone to win the scenario and if the units on the left are occupied long enough I could have a chance to achieve that. I happened to get the first turn this time. Blurry picture - I was so excited to play against Ken my hands were shaking! 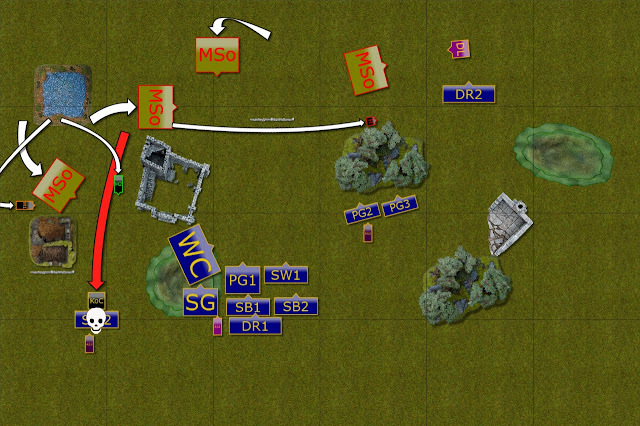 Outflanking maneuver and opening shots. 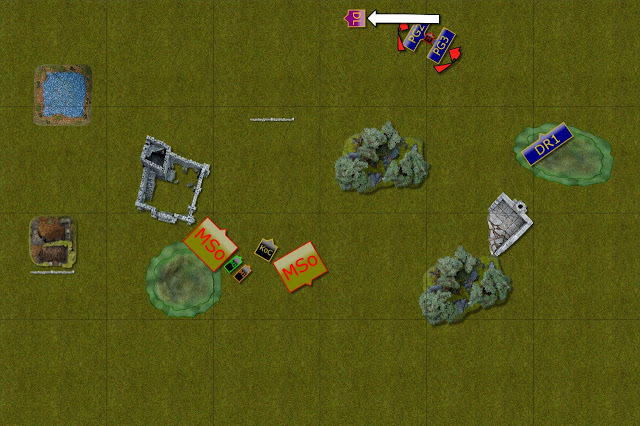 Elves moved towards the enemy territory with those on the right flank spearheading the advance, shooters in the middle already aiming at the enemy unit and those on the left getting ready to intercept the enemy. Varangur advance on the flank. The enemy knights on the left flank navigated through the swamps and were joined by their King too. Fluffy was already excited about the prospect of playing with Elf-things and fired up his joy along some lightning bolts cast by the nearby wizards. As a result, Elven Storm Wind cavalry wavered! Elves slow down their advance. Elves tried to navigate through the middle of the battle field but as they also wanted to avoid the attention of the enemy King that resulted in some serious traffic jam. 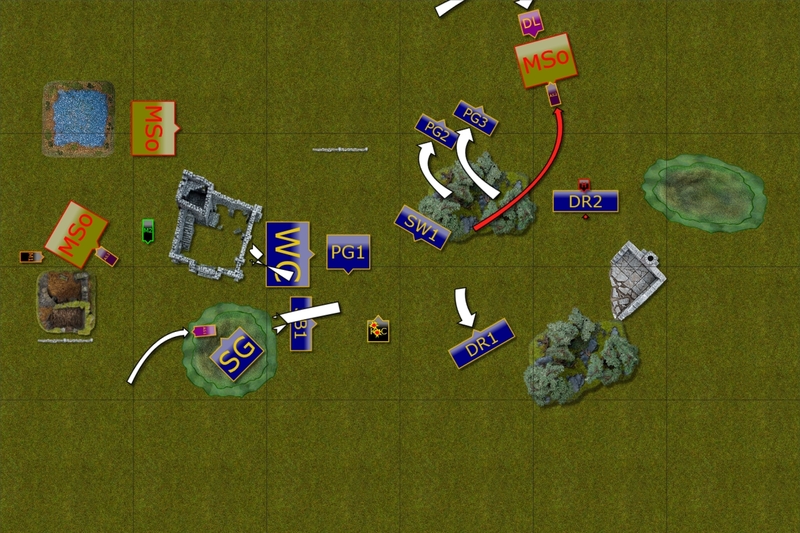 Only the units on the right maneuvered with more freedom, although Drakon Riders were not in the good position to intercept any enemy for now. On unit of Knights changes the direction of the attack. The King knew that Fluffy's patience is already spent so he spurred his mount to attack and scatter the unit of Elven Knights. The Wizards and one unit of Mounted Sons of Korgaan followed but the second regiment turned towards the center instead. The remaining units moved away from Elven units to avoid being attacked and Herja sped towards the opposite flank to intercept Drakon Riders. First unit of the Mounted Sons of Korgaan down! Elves units invaded enemy territory but that created some issues in getting in the right formation. 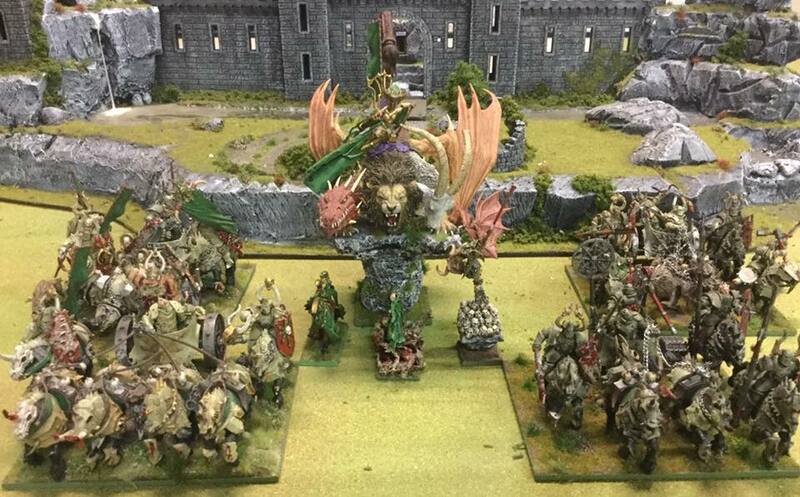 Also, the King on Chimera was already in the back yard and threatened to attack many units at the same time. The Drakon Lord and Riders on the right flank continued dancing around enemy units so that Palace Guard troops would catch up soon. Fluffy picks a new toy! Varangur forces attacked multiple targets. The King picked another unit and Fluffy chased it happily until they were all gone. Herja pinned down Drakon Riders on one flank while on the opposite side of the battle field, heroic Army Standard held against full unit of enemy Knights! Last but not least the Wizards started damaging nearby Sea Guard too. 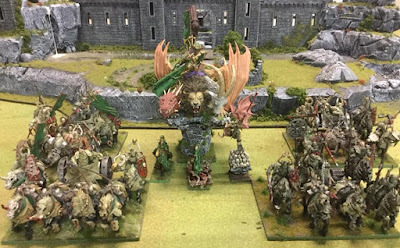 Some of the Elven units continued tightening the trap around the unit of enemy knights while the rest changed the formation rapidly to avoid being attacked from unwanted direction by the King on his trusty Chimera. Fluffy routs War Chariots this time. Both King and Herja eliminated one unit each. While the King pointed his mount at the War Chariots, Herja finished wounded Drakon Riders. The wizards did great too by frying Sea Guard to death and units of mounted knights finally got rid of annoying Army Standards blocking their way. Second unit of the Knights is gone. Palace Guard and the Drakon Lord finally managed to attack the enemy Knights and luckily routed them. Drakon Riders flew behind the cover of the nearby rocks to avoid being attacked by Herja. At the same time in the center of the battle field Storm Wind cavalry charged the King and managed to pin him down. Nearby Silver Breeze troop was blocking the enemy knights from entering Elven half of the battle field. 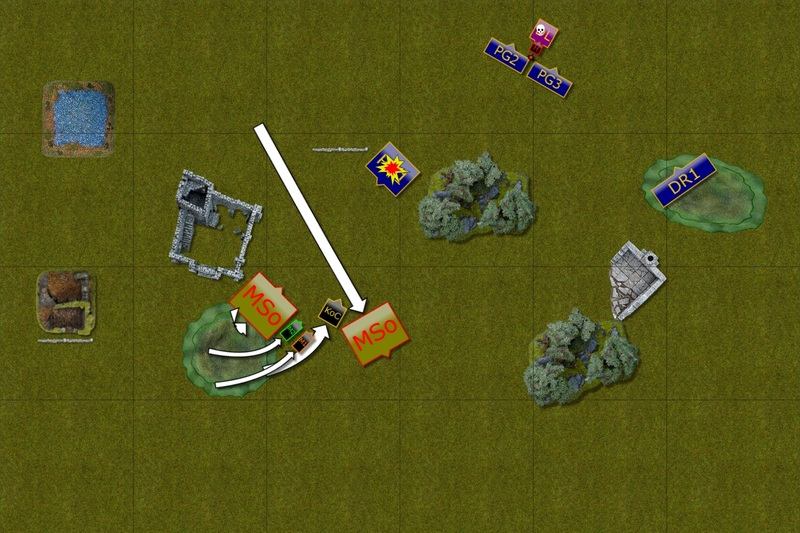 Two more Elven units die. 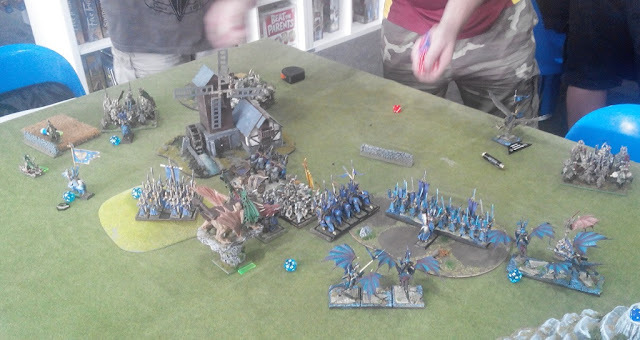 Both units of Knights managed to find the way to attack their enemies and two more Elven units die. The Wizards also cast some spells at the Palace Guard and did some damage. Finally, Herja picked Elven Drakon Lord but could not inflict substantial damage. Drakon Lord tries to fight back. Palace Guard regiment pulled back to avoid being charged by two enemy units at the same time but in doing so opens the path for invasion. The Drakon Lord fought Herja back but with not much of a success. Given the chance to invade enemy territory, the Knights didn't think twice and spurred their mounts forward. Then the wizards and the King joined forces and destroyed Palace Guard regiment in the inferno of fire. Only Herja failed to rout her enemy! Is the Drakon Lord going to survive? Herja laughs at the attempts to kill her. With not many units left the only option for the Elven units was to try and slow down Herja and to give a chance for the Lord to escape her. But her armor is tough to break through and little damage done didn't impress her at all. The enemy units remain in the other half of the battle field and it was up to Herja to tip the scales into Varangur favor. Unfortunately, for the third time in a row, she failed to do enough damage and miraculously, the Drakon Lord survived the battle! Many thanks to Ken for a great game! It was quite a battle where two extremely opposite philosophies of waging warfare clashed. 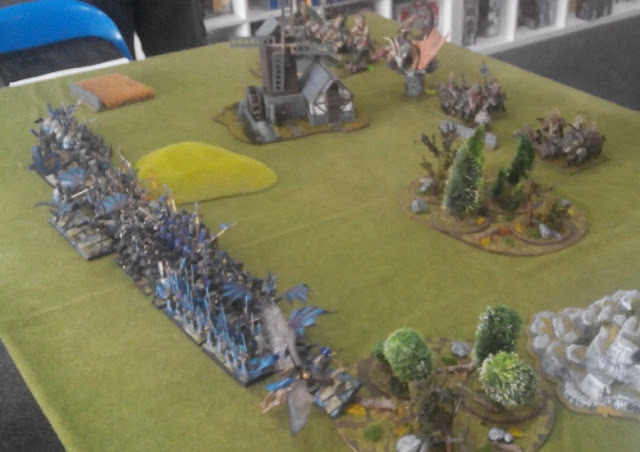 Cavalry hammer against fine Elven blades match up resulted in a draw but due to higher casualties on the Elven side the final score was 14:6 for Varangur. I was very impressed with the way Ken used his powerful King on his loyal pet Fluffy. The duo claimed no less than three units on their own and helped to fry fourth one too. Wizards can deal a lot of damage as well. They are expensive but the flexibility of Lightning Bolts and Fire Bolts upgraded with either Vicious or Piercing is fantastic. They too had a very important role to play and I think they delivered as they were responsible for wavering Storm Wind troop and destroying both Guards regiments. I know Ken is disappointed with Herja as if she only routed the Drakon Lord that would have been a solid victory for Varangur. Looking back at the game again I think there were a few factors from my side that also contributed to the overall result. First, the deployment could have been better. 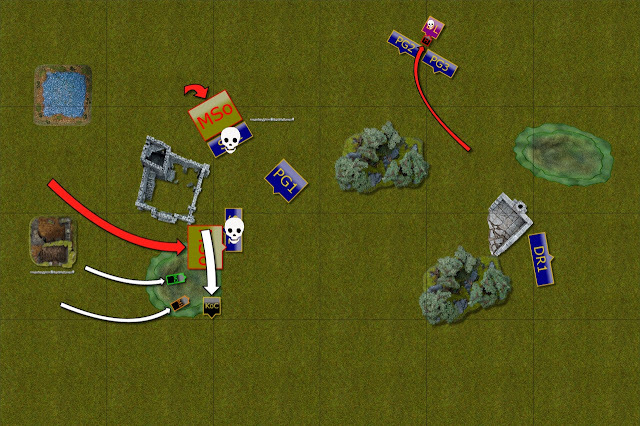 I didn't properly anticipate the potential of the combined ranged attacks from the Wizards and the Chimera so I needed another fast unit on the left flank to slow down the advance and maybe even intercept the King too. My own advance was unnecessarily slowed down because I started reacting to the movement of enemy units. Especially when the Fluffy landed behind my lines it was clear I made a mistake in not having anything to intercept them. It was quite possible that I should have had my Drakon Lord there as well for exactly that type of a situation. The traffic jams I created not only slowed down the approach but heavily affected the accuracy of the shooting and I got lucky to rout the knights, although it took me 3 turns to do so! 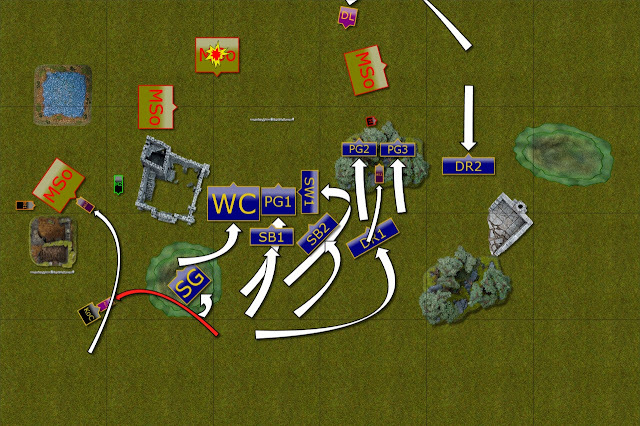 The advance towards the unit on my right was not fast enough either but while the infantry could not move faster then the coordination and mutual support of the units (in general, not only in that area) was bad. Very often either Drakon Lord or Riders did not have any enemy in their arc of sight and no wonder it took my 4 turns to maneuver and 5 in total just to get a single unit. 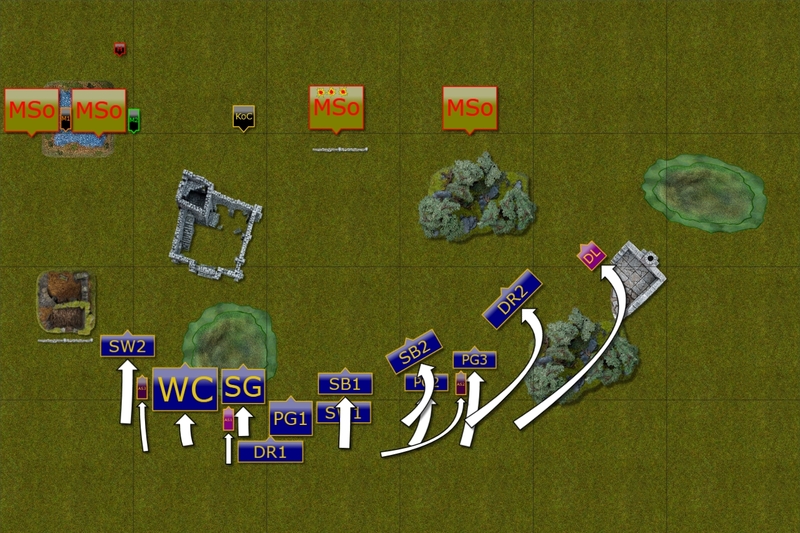 When we discussed the game with Ken he pointed out that my main mistake was to pull back Palace Guard regiment that opened the path for his Knights to invade my territory and equalized the total unit strength we both had in respective halves of the battle field. That was indeed a mistake but would have not mattered because he would have attacked me from the flank with a unit of knights and routed them. Because we played 7 turns he would have had one more turn to move the knights to my territory. While this mistake should not have happened, of course, I still needed the game to end in turn 6 to win and that is not a good strategy to follow.